And if your campaign is terrible, you'll effectively kill your entire party. Hey, look at that. An appropriate overlap would note that currently, one party is called the DM-ocrats. Huh? Huh? Get it? 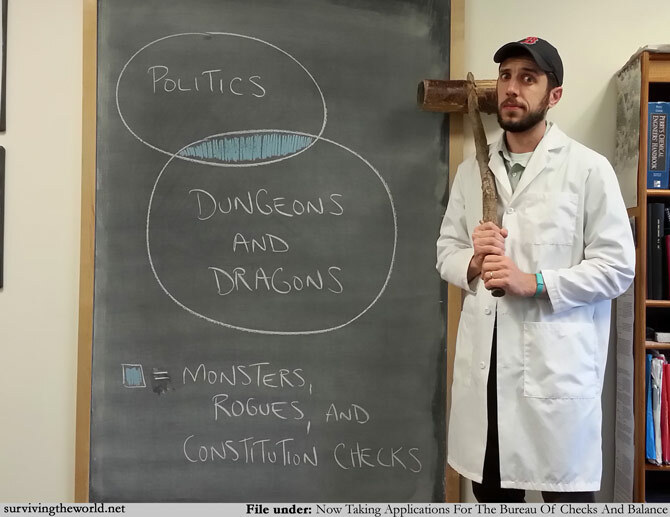 I've actually never played D+D and I'm kind of shocked that somehow that has come to pass. I know my character would probably be a scientist trying to comprehend how magic abides by the laws of thermodynamics and repeatedly shouting "HOW ARE YOU DOING THAT? ", but I guess I'll just have to wait until my daughters are old enough and nerdy enough to ask me to play along with them.